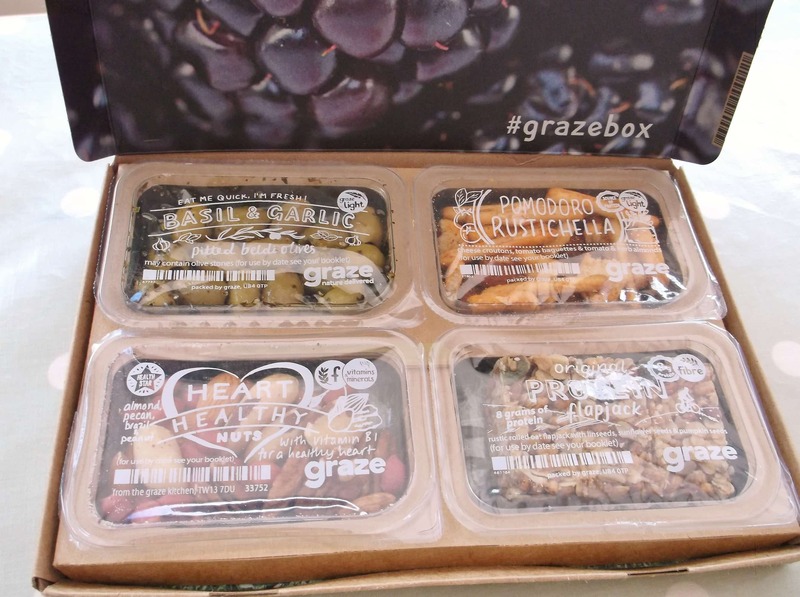 This week we have been checking out Graze Snack Boxes. Find out how we got on in our review. I think I’ve mentioned a few times before, but I am a food magazine addict. I used to read 1 or 2 a month, but then I became a food blogger and now I feel I need to read 4 or 5 a month “for research purposes”, or so I tell myself. I console myself that there are worse vices in life. One of the joys (or banes, depending on your point of view) of food magazines is all those little leaflets that fall out when you open them. Gorgeous pictures of fabulous foodie things that make you want to reach for your computer and buy one right now! Graze.com was started by a group of friends who all loved to snack but were troubled by the unhealthiness of the majority of snacks available on the high street. These friends decided to create a service that would offer healthier snacks by subscription. Their aim was to provide tasty, healthy snacks in a convenient way for busy people. You can order a weekly or fortnightly box, choose what snacks you do or don’t like and your order will be delivered a few days later. If you do nothing, you will continue to be sent a box at the same frequency every week. But you can easily skip or cancel your box whenever you want to. 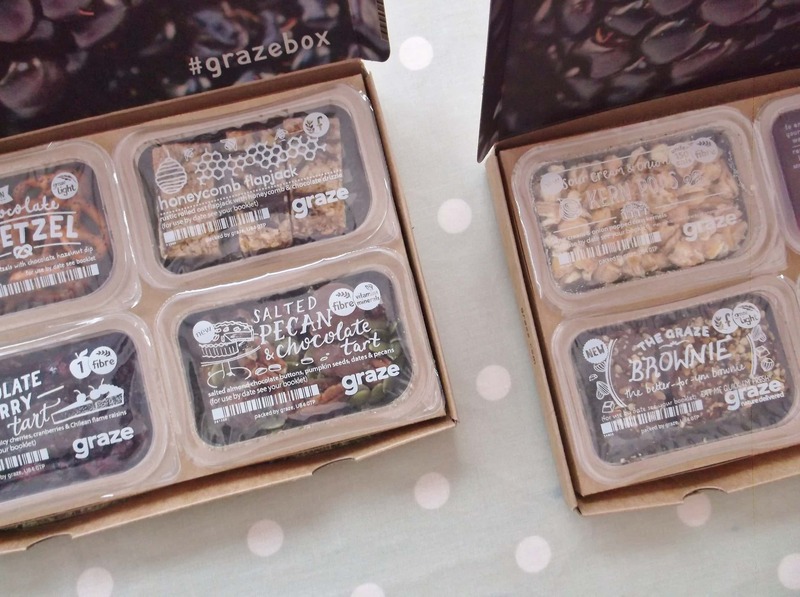 Graze offer over 20 different types of snack box. You can opt for a variety box which will be made up of any of the 120 snacks Graze have to offer. Or you can go for healthy options such as ‘lighter’ – a box containing snacks under 150 calories or the ‘low sugar’ box. Alternatively you can opt for more indulgent options such as the ‘chocolate box’ or ‘bakery box’. Each box costs £3.99 and contains 4 snacks. Delivery is also free and there are no extra hidden charges. There is also the option to buy larger sharing packs of snacks for £15. 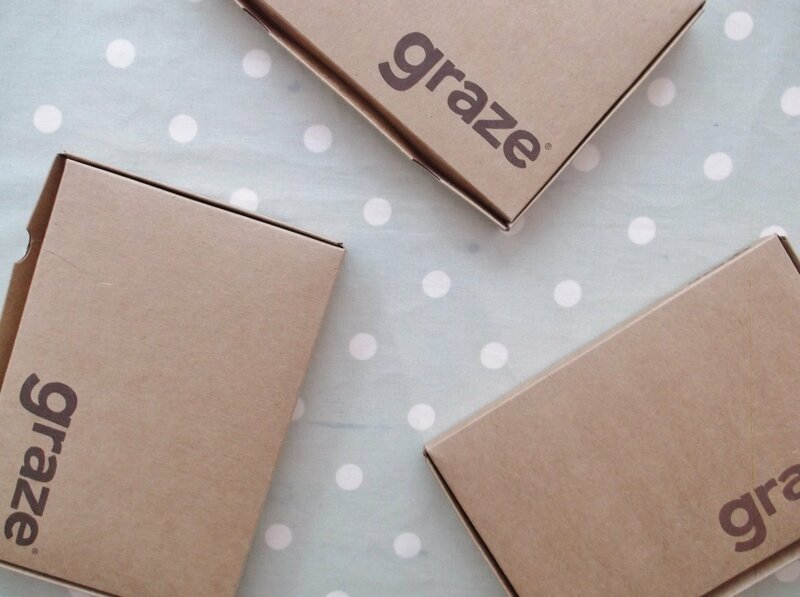 You can order a box at graze.com. Ordering is fairly straightforward, but for reasons I’ll explain later, a bit frustrating. First you have to click on get started now and then you can choose from 3 different types of boxes: variety (i.e. everything they sell), lighter (snacks that are under 150 calories) or a protein box (snacks high in protein). The next screen asks for your name and contact details and the next screen asks for payment details. All through this process there is opportunity to input a promotional code, if you have one. After this, they ask about your dietary preferences and finally you get a list of all the snacks that are suitable for you, which you can rate. You don’t exactly choose what goes in your box, but rather you say what you love, like, are willing to try and really dislike or ‘bin’ as they term it. Graze promise never to send you anything you really dislike and they prioritise what you do like, so you get those kind of snacks more often. It reminded me a lot of a film subscription service we used to get: you never quite knew what you were going to get, but you knew you would like it. I really like the idea of getting a little surprise every week, but I imagine there are some out there who might not like this so much. Now, I mentioned above that I found ordering from Graze rather frustrating. The reason is I really, really don’t like putting in my contact details and payment information BEFORE I find out what I’m getting. There is very little information about the service on the homepage, so it’s not really until you get to the snacks page that you finally work out what you are ordering. I would have much preferred to have a little bit of blurb on the homepage talking me through the process and telling me about the subscription service and preferably letting me choose what I was going to have BEFORE I paid. Also when you are finally through all the snack preference pages, you discover that there is a whole load of other snack box options that weren’t available on the homepage. Some really great sounding ones too, like the chocolate box or the flapjack box. I would have liked to see these options on the very first screen. The fact they didn’t give me all this information up front meant I didn’t actually get to order any of these other boxes. You don’t get to see this information until you’ve finished doing your love/like/try/bin section. Mid way through loving and binning snacks I had to pause and make dinner. By I got back to my graze order, after the kids bath time, Graze had already started picking and packing my order *sigh*. 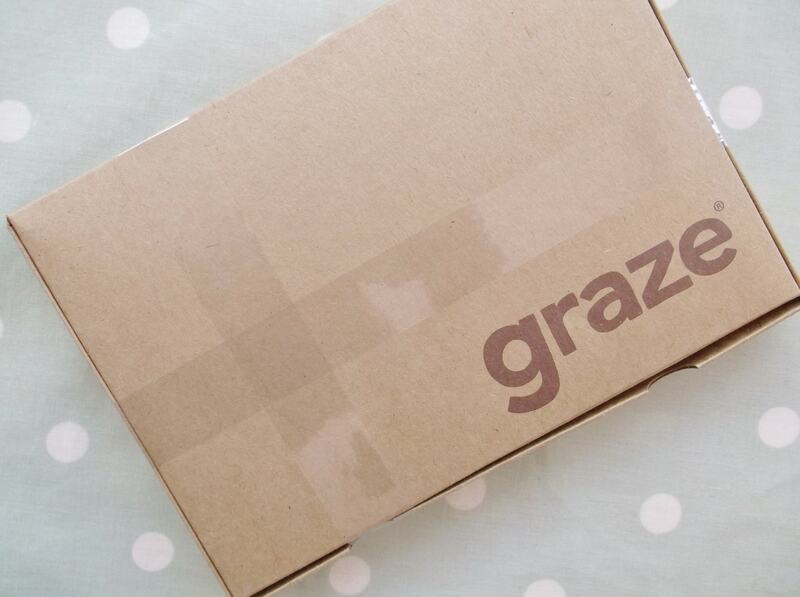 Please don’t let my frustrations with the ordering put you off buying a graze box though. The rest is really quite good…I just wish I’d known all of the above first or better still the website was a bit more friendly! If you want to see the snack options before ordering you can find them here (a page I stumbled on by accident later on – I wish I’d known about this first!). I ordered my box on a Monday evening and I was told it would arrive on Thursday. My only little gripe here is that I would have liked to know this information upfront, and/or had a little more flexibility about choosing my delivery day. The good news is, once you are in the system you can choose your delivery day and amend how frequently you get your box (weekly or fortnightly). My box arrived as promised, in the post, on Thursday morning. 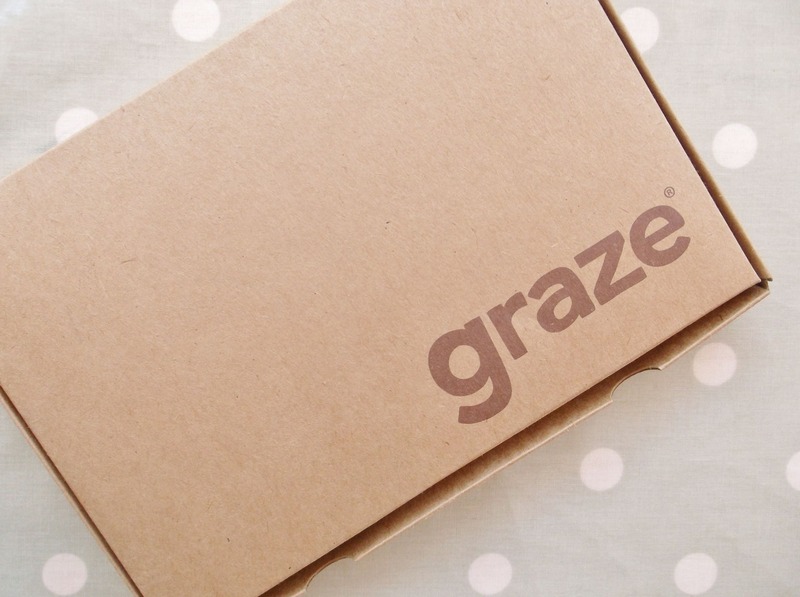 The lovely thing about the standard Graze boxes is they are designed to fit through a standard letter box, meaning you don’t have to worry about being in when they deliver. You can also have your box delivered to your workplace or anywhere you want – you can even send one as a gift. Graze are really proud of their packaging and understandably – the card is thin but strong, comes from sustainable forests and is biodegradable and recyclable. Opening my box was very exciting as I had absolutely no idea what would be in there. Inside I had 4 big compartments each with a different snack. My first box included Basil and Garlic Olives, Original Protein Flapjack, Pomodoro Rustichella and Healthy Heart Nuts. All the snacks were beautifully presented and had survived the trip in the post well. The next task was the taste test. I love olives, basil and garlic, so it was no surprise that I really loved these olives. They were delicious. My husband and son agreed but my daughter, who hates olives, hated them (unsurprisingly!) Graze also do Lemon and Rosemary olives and Moroccan Harissa olives, which I’d really like to try. Normally I am a bit overindulgent with olives. But the lovely thing about Graze is it all comes beautifully portioned up, so you don’t eat too many. They also tell you how many calories are in each snack, so you can keep track. These basil and garlic olives are 129 calories for 39g. A lovely flapjack, packed with oats, linseeds, sunflower seeds and pumpkin seeds: a great way to get more seeds into your diet and a whopping 7.8g of protein and 2.8g of fibre per 54g portion. The kids and I really liked this, though I did find it quite sweet and my husband found it altogether too sweet to eat. When I checked, I found there is a whopping 12g of sugar per portion – a shame because it doesn’t seem necessary. I’m sure this would be delicious with half the sugar. For a company which was founded on the principle of healthy snacks, I’m surprised. (Though to put things in context, a 51g Mars bar has 30.5g of sugar.) There are 8 other flapjack options available on graze.com such as: lemon drizzle flapjack and fruity flapjack and you can even order a flapjack box, if you are a real flapjack fan and only want to receive flapjack. The good news is once you are though the slightly annoying ordering part, the ongoing management of your subscription is really easy and pleasurable and much more user friendly. Log in is easy and there is a clear click through to the ‘manage my box’ page. From here you can change which day you have your box delivered, change the frequency – though only between weekly and fortnightly, I’d have liked to see some more options here. You can also snooze your box (i.e. skip out a week or two), cancel your subscription entirely (under the ‘more options’ button) and change which type of box you have delivered and the delivery address. It’s all really clear and user friendly and I wish the ordering process had been more like this. This is also the place where you can find out about the other boxes available and amend your love/like/try/bin preferences – so if you get something you don’t like, it’s really easy to bin that one so you never get it again. If you fancy trying out a different box you can easily switch to one of the other boxes, set up an additional subscription for a different box or order a one off box, either for yourself or a friend. In the interests of thorough testing I ordered a one-off lighter box and a chocolate box (just to get both sides of the spectrum, you understand) and can report that both boxes were just as good as the first. My particular favourites were the Salted Pecan Chocolate Tart (salted almonds, chocolate buttons dates and pecans) and the Brownies. There were a couple of things I didn’t like: the Sour Cream and Onion Kern Pops were a bit weird and the Carrot Cake was way too sweet for my liking, but the beauty of Graze is that once you’ve had something you don’t like, you can ‘bin’ it and you never have to have it again. In fact, you don’t even have to log on to bin things: Graze send you an email shortly after you have received your box from which you can amend your preferences – so simple. Graze is a really fun way to receive healthy, tasty and different snacks. It’s great for adventurous people who want to try some unusual snacks, that would be difficult to get from the shops, but it’s great for ‘fussy’ people too – if you are willing to go through all the snacks and say what you don’t like, then you will only get snacks you know you will like. Graze is good for busy people. Once your subscription service is set up, your snacks will arrive automatically and, unless you want to, you never have to do anything with it again. But if you do need to change your order, this part of the website is very user friendly. Pricewise, I think Graze compares favourably to buying snacks on the go. For example my chocolate box contained brownies, a selection of dried fruit and nuts, a flapjack and some pretzels with a chocolate dipping sauce and cost £3.99. If I had bought these individually from a newsagent or similar, they would have cost at least that much, and much more from a coffee shop. Delivery is also free and there are no extra hidden charges. Well, I’ve already expressed my frustrations with the ordering process. I really like to know exactly what I am ordering before I give my details – especially my credit card details for a subscription service!! It’s such a shame because what Graze offers is so good, but I wonder how many people are put off by the same ordering frustrations. It really does take the shine off what should be such a pleasurable experience. If you do want to know in advance what snacks are available then check out this page which lists all 120 snacks Graze offers, so you know before you buy! This is certainly not the cheapest option. You can obviously buy 4 snacks for less than £3.99. If you are watching the pennies then £3.99 for 4 snacks probably seems a bit extravagant. This is probably not the healthiest option. For obvious reasons they don’t offer fresh fruit and vegetables. And some of the snacks have very long lists of ingredients, which worries me slightly. As I’ve mentioned above, some of the snacks do seem to have more sugar than is necessary – thought nowhere near as much as a Mars bar! This is definitely not a good option if you are weak willed. The snacks are very delicious, and it is very tempting to scoff the lot all at once. I wonder how often this happens? Perhaps the good people at graze should offer a daily subscription service which just delivers one snack at a time! Graze is also not great for people with allergies. Graze are quite clear and upfront about this. Although you can select snacks which don’t contain dairy/gluten/nuts/etc., they absolutely cannot guarantee that your snack will be allergen-free as all the snacks are packed in the same place, meaning there is a risk of cross contamination. Whilst this must be frustrating if you do have allergies, it is nice that Graze are so upfront and honest about it. Here’s to hoping they will be able to offer free from snacks in the future. What could Graze do better? Apart from fix all my frustrations with ordering, the one thing I would have really liked to see was a kids box. My kids thought these boxes were fabulous and were so excited when they kept popping though the letterbox. But these snacks are all designed for adults and in adult portions. I would love to see a kids box with child-size portions – with perhaps more, but smaller snacks per box. I’m sure my kids would be delighted to have a their very own box that popped through the letterbox each week with one or two snacks per day, from which they could choose which snack they could have and on which day. So who is Graze perfect for? Anyone who wants delicious, easy, convenient, hassle-free snacks delivered through their door every week. Anyone who wants to be taken out of their snacking comfort zone and anyone who is strong willed enough not to just scoff the lot the second it drops through the door! It’s also perfect for anyone who likes the idea of a subscription service, but wants to check it out first. If you don’t like it, you can easily cancel your subscription whenever you want. 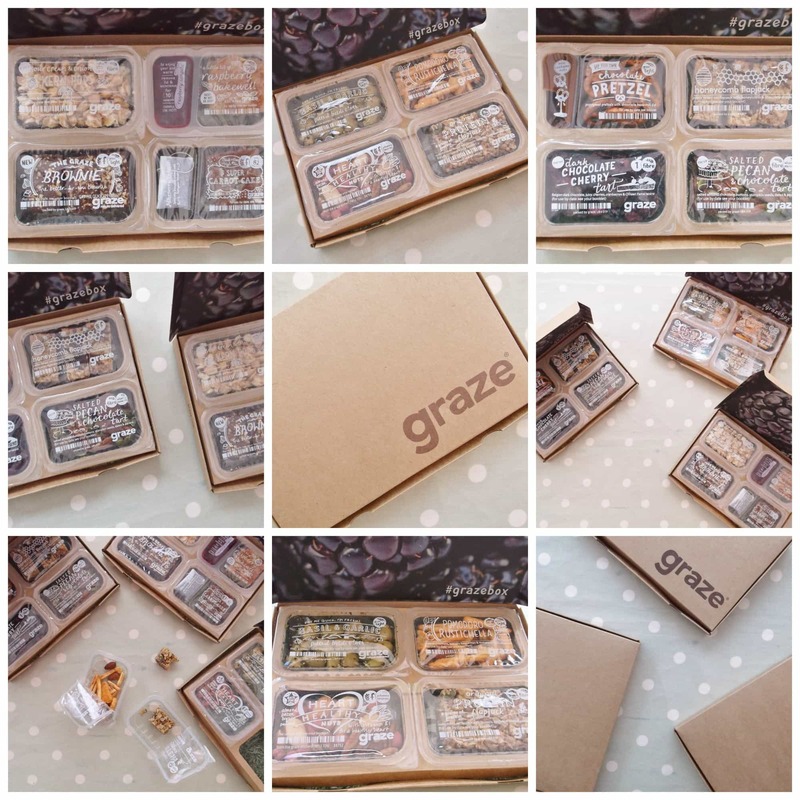 If you want to try a Graze box click here to be taken to the page where you can order your first Graze box or click here to go to the bit where you can see what all the Graze snacks are. Remember you can ‘bin’ any of these snacks so they never appear in your box and remember too that you can easily cancel your subscription if you don’t like it. You are not tied in. 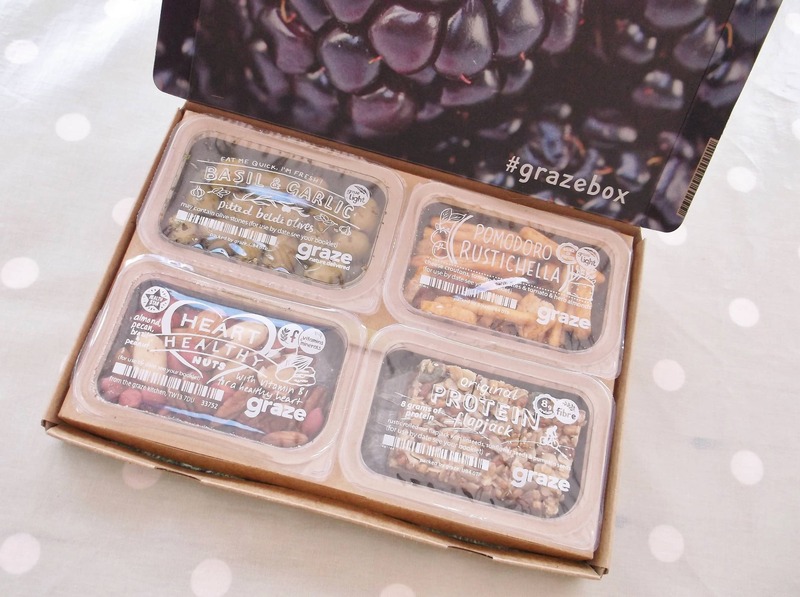 Have you tried Graze boxes before? What did you think? Let me know in the comments below. 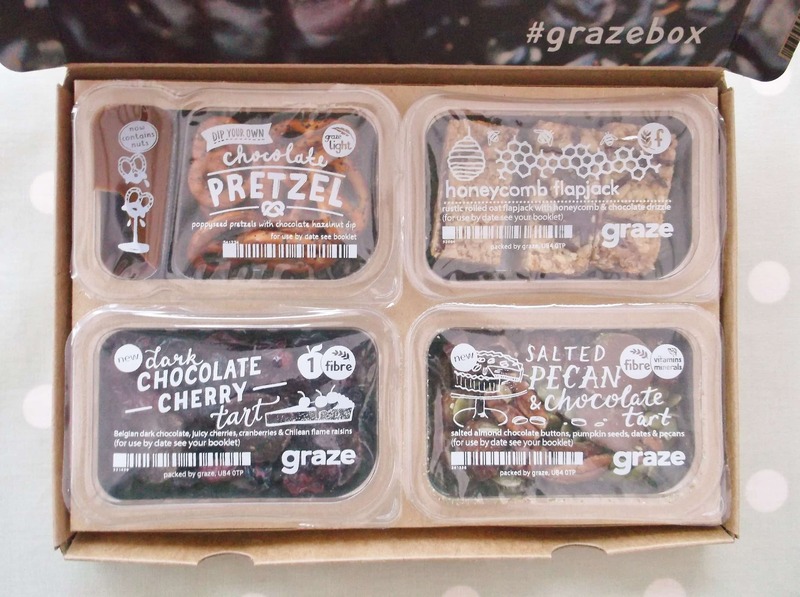 And if any of you do try a graze box as a result of this review, I’d love to know how you get on! I had a voucher for a free Graze Box but declined the offer because they wanted my bank details before I even received the free gift. Although I could have cancelled after the free one – that’s hassle. When I queried why they wanted payment details before despatching a free gift they said it was so they could check that no-one had received more than one free one! I too have often seen the Graze leaflets in those ‘necessary’ food magazines 😉 and have wondered about trying them. I’ve never gone beyond the wondering stage because I wasn’t sure about ordering food which comes through the post and I like to see what I’m buying (I know, a tad old fashioned but that’s me). It was interesting to read your review Eb and to see that the snacks were well sealed and were easily popped through a standard letterbox. Just got my sampler box and was extremely disappointed. I stay away from processed foods as much as possible and that’s all these treats were… processed and mostly junk. The dried fruits had added sugar, the ‘honeycrisp’ bar was nothing but palm oil margarine and non gluten free oats, and the cashews were honey coated, so were not vegan, as we had requested. Very disappointed and immediately cancelled our account. its an good snack while im on my pc reading my email or even just playing my games or doing my craft.